In this new series of short articles, ‘Snapshot,’ we tackle common misconceptions about religion, in particular the Islamic faith, which commonly lead fair-minded individuals to turn away from the very concept of religion. We at Rational Religion argue that faith, practised in its true form, is both rational and in harmony with human nature. The first article in this series addresses the widespread perception that Islam endorses punishment for apostasy. 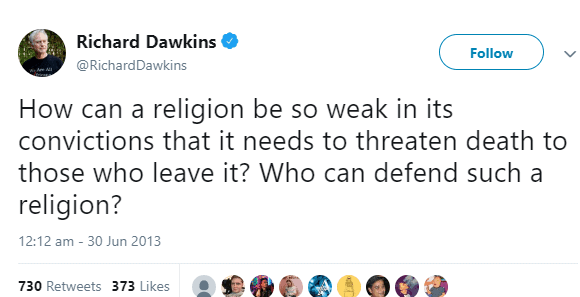 For once, I agree entirely with Dawkins. No-one should logically defend a religion which advocates death to its apostates. However, the insinuation that Islam is that religion is entirely incorrect. Sadly, it is not just Dawkins who believes this, however. Given that many Muslim-majority countries in the world today legislate the death penalty for leaving Islam, as recommended by a whole host of scholars who seem to lack the most basic understanding of its holy book, it is perhaps of little surprise that ‘apostasy in Islam’ has become a bit of a contentious issue. Scholars may contest this according to their own whims as they please, but Islam could not be clearer or more straightforward on this non-issue. ‘Belief’ is defined as an ‘acceptance’ of something being true, and any acceptance which is enforced holds no value. Threatening force in the case of leaving religion amounts to enforcing adherence, which cannot result in sincere or meaningful seeking of the Divine. The Qur’an makes it absolutely clear, that, as it is ‘the truth from your Lord’, it inherently stands in complete rejection of any kind of enforcement or obligation – which is exactly what punishing apostasy is. Endorsing punishment for apostasy is itself a huge disservice to Islam and the Holy Qur’an, and is a tacit admission on behalf those who claim to be their most zealous defenders that the faith is intrinsically inadequate in its persuasion, and require human assistance in making up for its ddeficiency. This idea is of coursea anathemato their central claim of being of Divine origin. Faith is a matter of personal choice – only when someone willingly seeks God does it merit any reward. If, as some insist, they are obliged to force others to believe, then we must ask – was God not able, by their own belief, to do so much more quickly and effectively instead? Mustafa Siddiqi is a student of the Ahmadiyya Muslim Community’s Institute of Theology and Languages, where he is studying to become a missionary of the Community.